Smart phones can be used to capture and report data from the point-of-care, which can help improve patient care, surveillance and monitoring, logistics and supply chain management, programme management and market opportunities. Adapted from: “The GSID System: Real-Time Data From the Point of Care,” Haynes Sheppard, Ian Francis. A patient presents to the healthcare facility with prolonged fever and chills. Within moments of diagnosis using a rapid-test for malaria, the results are disseminated to health officials 200 kilometres away who are able to track the prevalence of malaria in real-time. This, made possible with a smartphone and cloud-based programming, is an initiative that researchers have been developing in order to maximise disease management in resource-limited settings. Such a system could prove especially important for enhancing quality and timeliness of surveillance methods. For example, as data accumulates into the electronic system, they can be monitored for suspicious activity (high rates of positive test results) in order to detect disease outbreaks. This data can also be used to inform evidence-based decision making at the policy level. In the last decade, scientists have invented rapid-result diagnostic tests (RDTs) for infections including HIV, malaria, dengue, and hepatitis B. However, even with the use of RDTs, there are still problems in regards to reporting and aggregating result data. Excessive paperwork is time-consuming and inefficient. Possible solutions to these problems include using diagnostic methods that conform to WHO’s ASSURED criteria; enforcing adequate QA systems; providing better training; and utilising information technology. 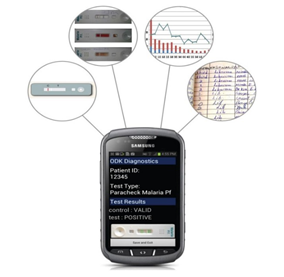 In response to these needs, GSID, working with the University of Washington (Seattle, WA, USA) and the social enterprise Dimagi (Boston, USA), has created ground-breaking new software for Android smartphones to read, digitise and transmit point-of-care (POC) diagnostic results for significant infectious diseases. Workers in healthcare worldwide will have quick and accurate diagnoses for their patients, and public health officials will be able to view real-time results and analysis compiled data using a secure, cloud-based database. The system will be a crucial step for patient care, health system evaluation, and global disease surveillance and control efforts. Along with being easy to utilise, the system allows healthcare workers to capture the results of various POC tests with an Android phone camera, and submit it instantaneously to a central web database for public health officials, which is secured or accessed according to national regulations and guidelines. Ian Francis of Global Solutions for Infectious Diseases (GSID) and Dr. Haynes Sheppard, GSID consultant, describe a proof-of-concept study conducted in late 2013: In partnership with Zimbabwe Ministry of Health and Child Care and funded by Econet Wireless Zimbabwe, GSID trained over 60 healthcare workers in the Manicaland province – at a provincial hospital, two district hospitals, and two rural health centres – to use the GSID System for HIV and malaria RDT tests, providing a phone for each department in hospitals performing tests. After two months, the GSID system had collected demographic data and images for 2,500 test results, and officials were able to identify and correct any inaccurate readings. One of the primary goals of the study was to determine the equivalency between reading tests with the software and trained healthcare workers reading the test without software. Sheppard states, “There was excellent agreement between the visual interpretations by the nurses versus the RDT reader.” Programme training for healthcare workers took less than an hour, and data entry took about 90 seconds per result. Those trained reported that the smartphone RDT reader was easy to learn, user-friendly, beneficial, and non-disruptive to their work flow. A benefit specific to the GSID system is that it has a universal approach to reading RDTs from multiple manufacturers, so healthcare providers can pick tests that suit their needs and budgets. This flexibility will also allow the system to expand as new tests are developed, including RDTs Ebola that are currently in accelerated development. The reader software will establish a standardised interpretation of results to guide the diagnostic and treatment path for patients, also helping to monitor disease outbreaks or new health threats. Eventually, GSID will incorporate already-existent test results from diagnostic devices and POC laboratory management systems. GSID will also help local healthcare workers and caregivers to incorporate this new database system into local healthcare systems and record-keeping. The next steps GSID has planned are to ameliorate any issues discovered in the test data, to run a bigger, province-wide study, and to determine how to link the data with national systems and solve data transfer issues. “Our reader stands out in a number of ways,” Sheppard says, “…next, we plan to demonstrate both scale and value within Zimbabwe … and then our goal is to implement our system in other countries around Africa.” GSID is also working to garner interest and support from international public health organisations for broader implementation.